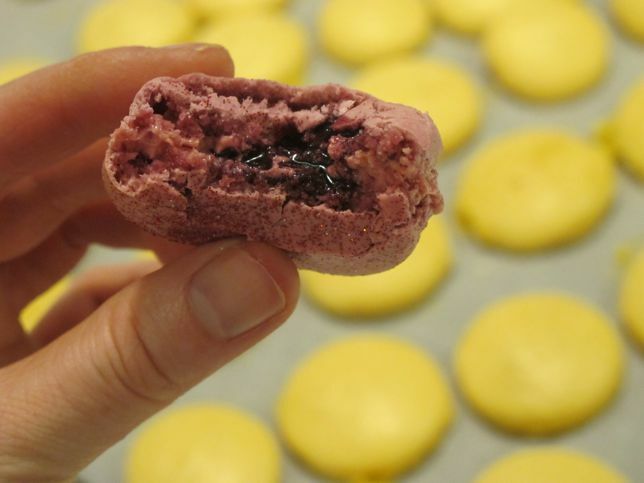 Have you ever wanted to make perfect macarons? 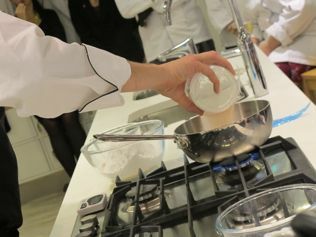 This macaron class at Waitrose cookery school was just the biscuit. 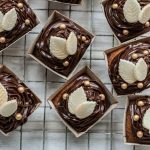 In the last week I was faced the choice of attending a Green & Blacks chocolate cook off event at the wonderful Miele showroom and also to take a macaron masterclass at the Waitrose Cookery School. Since I can only reasonably drop my son at daddy’s office once in 7 days, I opted to visit the shiny brand new Waitrose facilities. 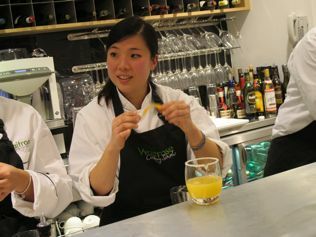 Waitrose Cookery School is situated above the Waitrose John Barnes branch on Finchley Road, North London. 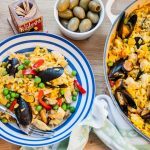 Their classes commence from November 8th just in time for anyone hoping to brush up their culinary skills prior to Christmas. 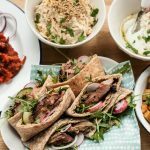 Staffed by a seven-strong professional chef team, four of whom have worked in Michelin star kitchens, the school aims to teach students not only to be confident cooks but to get the best from local, seasonal and more exotic ingredients. 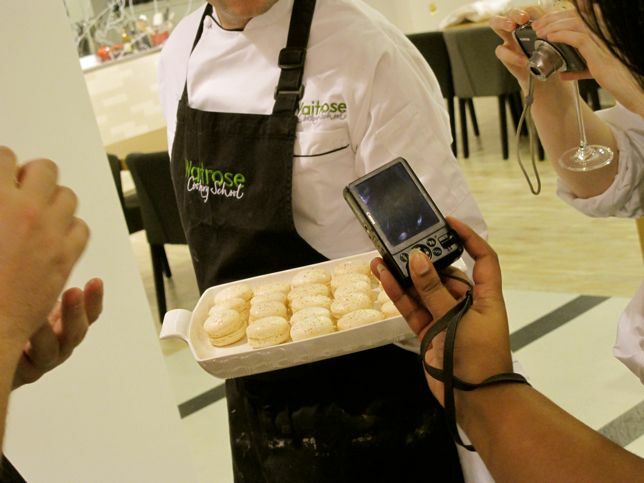 Our host was James Campbell, a pastry chef with over 20 years experience in five different one star Michelin restaurants and member of the Academy of Culinary Arts. 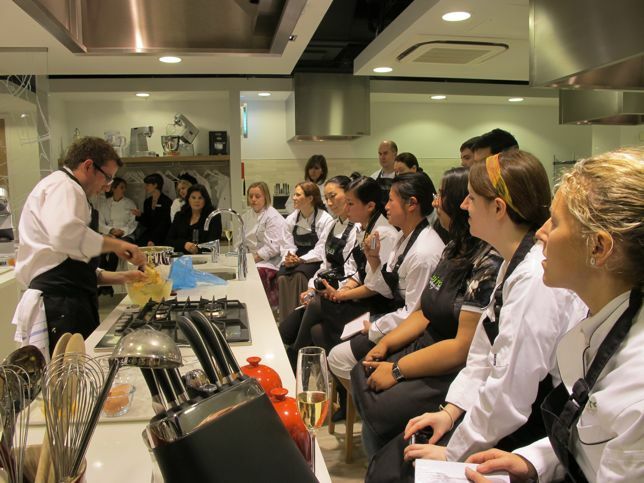 One day classes at the school include bread making, Thai food and seasonal dinner party menus. 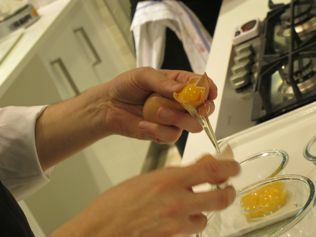 Half day classes include hands-on chocolate class (which sounds messy! 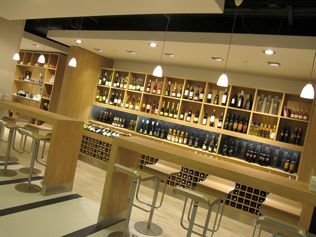 ), canapes and cocktails, Michelin star pastry desserts, wine and cheese course and petit fours. 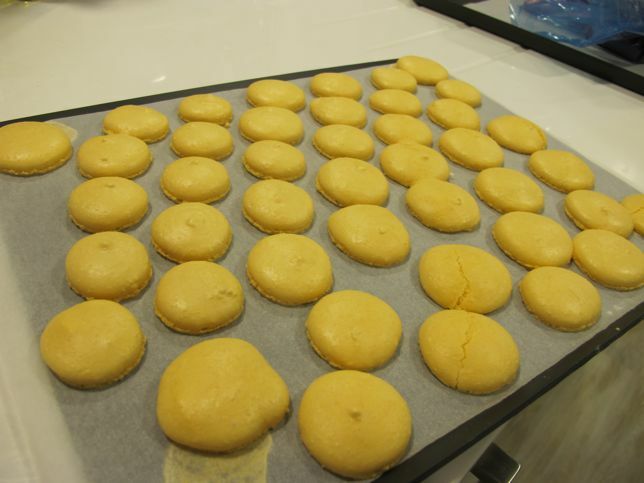 It was my first time making macarons with the Italian meringue method where the egg whites and sugar are partially cooked before putting the shells in the oven. This eradicates the need for a drying out time and gives more reliable results. 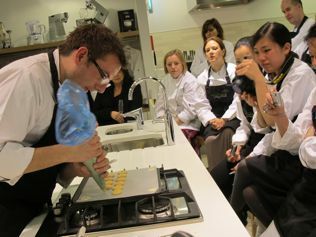 Everyone agog as James whips his macaron batter into a frenzy. He must have strong muscles as it was tough going when I tried it later! 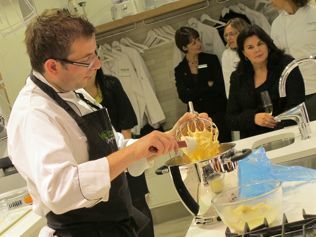 He even made getting the batter off the mixer whisk look easy. It took me ages! I was especially impressed with the Kenwood Cooking Chef Major which we used to heat and whisk the Italian meringue at the same time. At £999.99 (gulp), it should be impressive, a seriously chunky reassuring piece of kit that makes it’s rival products look like Tonka Toys. 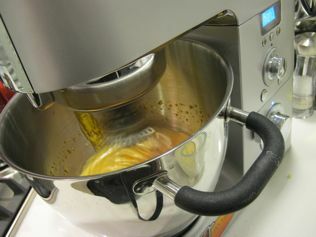 A cheaper gadget we had to play with was a digital thermometer with probe for measuring the heat of the boiling sugar. We used a Tala one but this Mastrad Meat and Jam Thermo Senso available from Amazon seems very similar. A few minutes whisking and our meringue was ready to pipe. We were using giant blue disposable piping bags which were a much better size than the little ones I usually use at Lakeland. I must find out where to get these. Whilst my macaron shells were in the oven I had a few minutes to look at all the fabulous equipment. 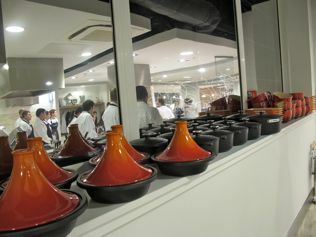 It was strange to see a whole wall of tagines, giant frying pans etc but these all get positioned one per work station depending on what the class is doing that day. Everyone gets a work station like this to work at. Way better than school home economics class! 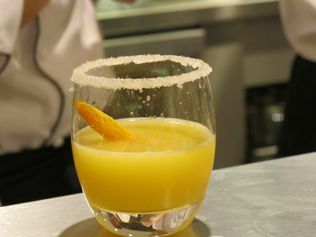 Whilst the macaron shells were baking we had chance to make cocktails – this little number was orange and Grand Marnier. 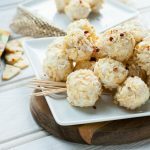 Having arrived too late for the canapes earlier it was also my first chance to chat with other bloggers including Kavey, Becca, Gourmet Chick and Gary Big Spud. My turn! I never imagined what great fun this would be. It’s enough to make you want to install a cocktail bar in your own house. Maybe Derek Trotter and the Duckworths weren’t so crazy after all. All hail the egg nog macaron! We tasted these alongside our cocktails. 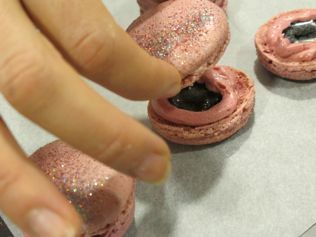 Next up we were filling some pre cooked glittery macaron shells with pink buttercream and a mulled wine reduction in a squirty pot. I’m reliably informed that Waitrose will be stocking this edible glitter in the new year. Until then you can get it online at places like Cookies Crafts and Cakes. 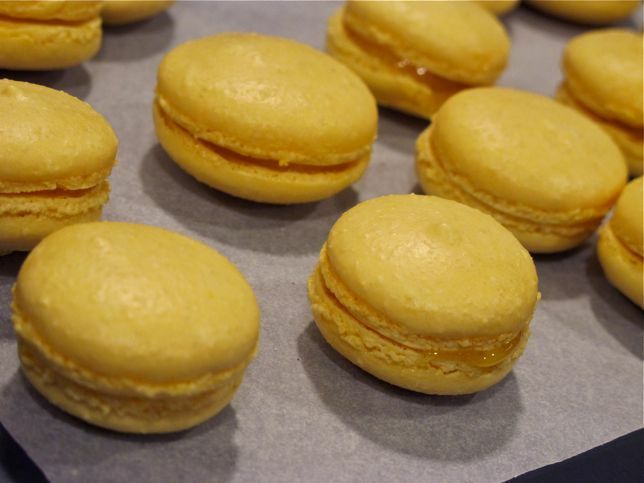 Below are my macaron shells filled with a citrus sauce. 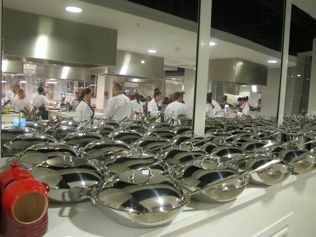 I was delighted with my visit and would dearly love to try out some of their other courses. 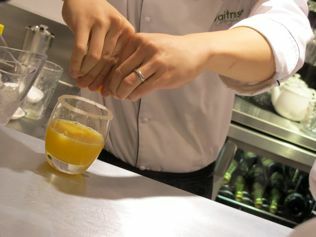 If you’d like to try it yourself, or book a masterclass as a gift for family or friends, you can book via waitrose.com/cookeryschool or telephone 020 73726108. 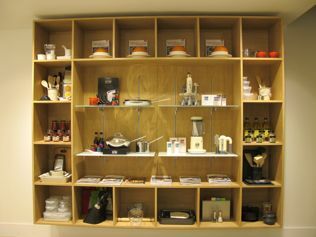 Each one day course will run from 9.30am until 4.30pm at a cost of £175 including all ingredients, wine and equipment. Half day courses start at 9.30 and finish at 2pm or commence at 5.30pm finishing by 9pm. 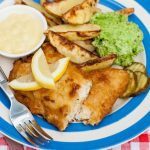 These shorter courses cost £105 and 2-3 hour demonstrations, depending on the course, will be approximately £65 including food and wine. The school will be open from Monday to Friday. So, chocolate, macarons, macarons, chocolate or something else? 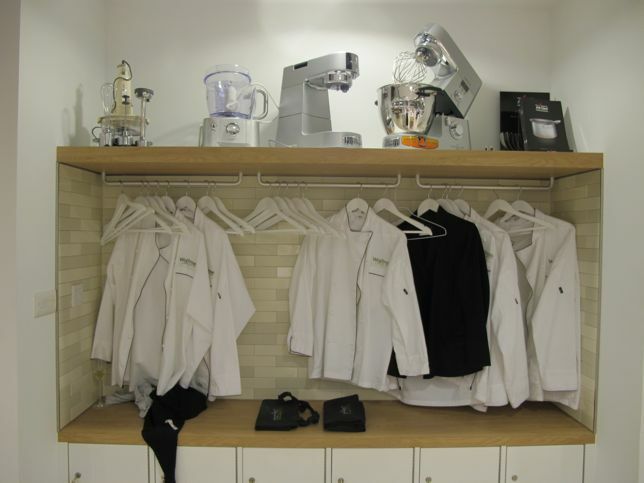 What would you prefer to take a cookery class in? What a gorgeous place Sarah! So jealous you got to spend the day there but thanks for letting us live vicariously though you! 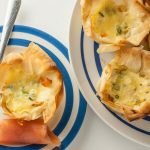 I recently used the Italian method for the first time (during the humid summer) and was happy with the results appearance wise but not how they tastes – too crunchy for my liking. But I will try again soon. Egg nog? Inspired! I didn’t notice any difference really, mine tasted ok and the ones they’d made in advance even better! I want to go here! My friend makes macaroons. Can’t understand how anyone makes something so pretty and fragile AND yummy. You must try, it’s the most wonderful feeling when they work out well. Those macs really look great. I didn’t know waitrose had a cookery school. I’m going to check that out. I am so upset that I never got the e-mail asking me to this! But I have been promised a class at another date! Lots of familiar faces there! You’ll probably get longer than us…. you’ll love it. 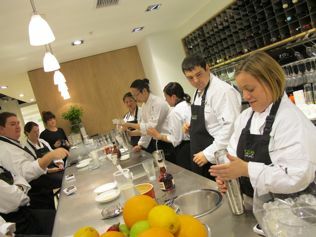 Great write-up on the class Sarah, looks like you all had a great time. 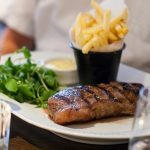 I’m booked onto one of their one-day classes, and know a little more of what to expect now after reading this. I will wait to hear with interest! I don’t think many people appreciate how difficult it is to make the perfect one. Yours are wonderful – such delicate little skirts. Thanks for sharing. Feet, skirts… the bane of my life with macarons. They’re just not the same without are they? What a fabulous time you had Sarah…WOW!! I love the way the macs got made, and love the flavour combos too. The wne reduction and lemon are calling my name. 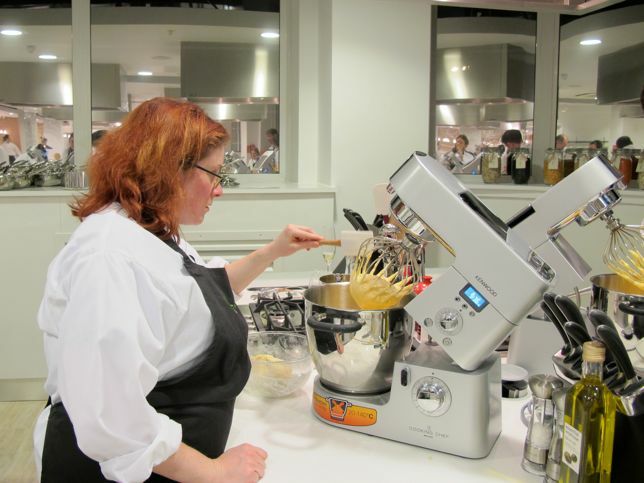 The KA has me drooling with envy…Oh to be in England, now that Waitrose has classes! 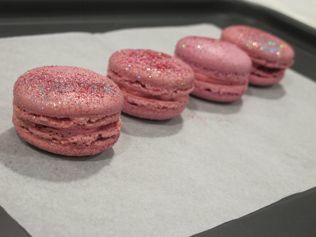 Thankfully my macs have behanved quite well the last 2 times this week, but I would LOVE to try the Italian meringue way to make ’em. Gorgeous post! You do the funnest things! I’d love to learn to make macaroons! 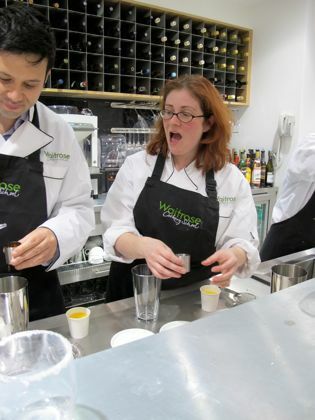 I’ve already been on Waitrose’s cookery school website to find out more! I can’t wait to take a class or two!! I’d love to hear how you get on, I loved it there. I hope my kitchen isn’t normal! The class sounds like a lot of fun. If I was still in London I would ask for a class for a Christmas present…. we could go together! Maybe another time, eh? I am still hoping that someday I will own a KitchenAid, let alone a monster like that machine. My kitchen is just much, much too small at the moment. One day, I keep telling myself! 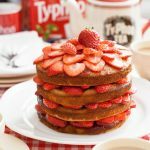 I’ve have to ditch something pointless like maybe the kettle if I had one myself! Let me know if you are ever over here, it would be great to meet up again! Sarah, I’m so looking forward to coming to spend some holidays with you – however, I must time it well to make the best of your jet-setting! LOL, and btw that 1K Kenwood mixer looks like a great thing to win in a giveaway! 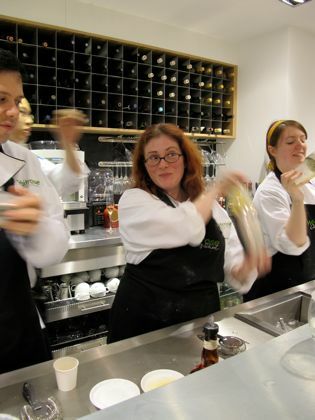 Great write up Sarah – I really enjoyed the class although feel the prices were steep. I also went away deciding I NEED one of those digital thermometers – so good. 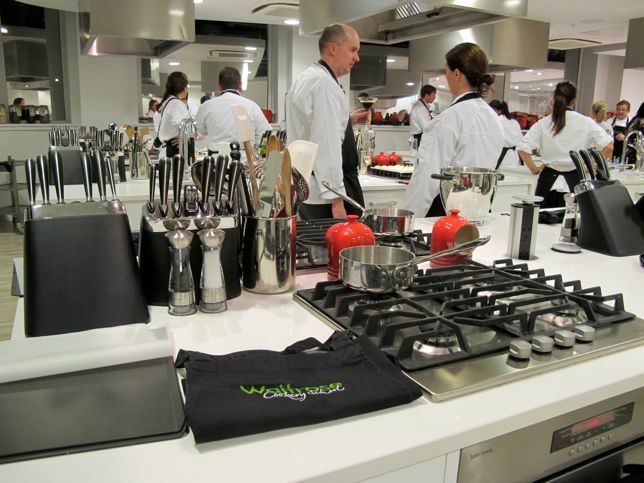 Wow the Waitrose Cookery School looks so slick and shiny – what a great course! 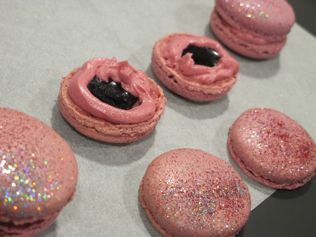 The macarons look divine – mulled wine reduction?!!! Yum!!!! 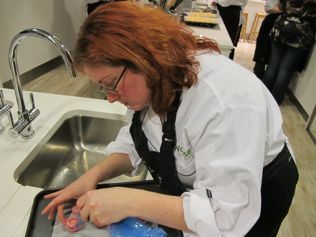 I saw those blue piping bags in use at a bakery icing cupcakes – you must be able to get them from catering suppliers. Let me know if u have any joy finding them! Excellent write-up. Great to meet you there, such an amazing venue and wondrous facilities. And the mulled wine macaroons were to die for. 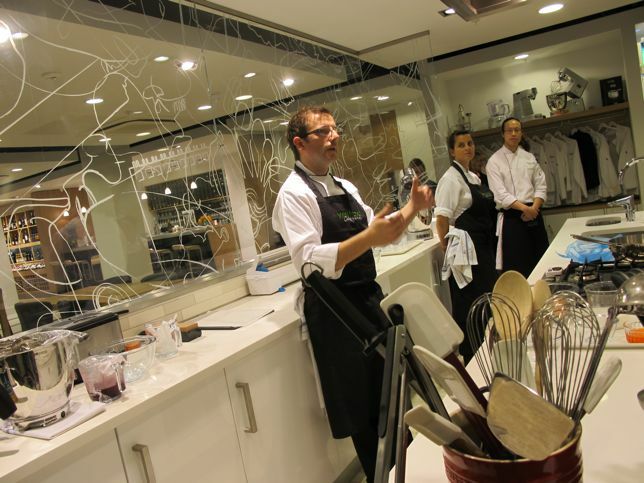 Thank you for sharing your day at the Cookery School. 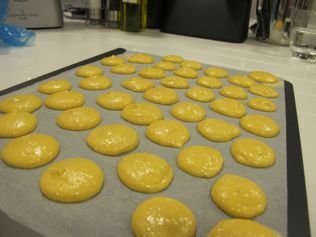 I found your blog via a google search and now I shall be organising my very own macaroon day there! You need to check their website for that!